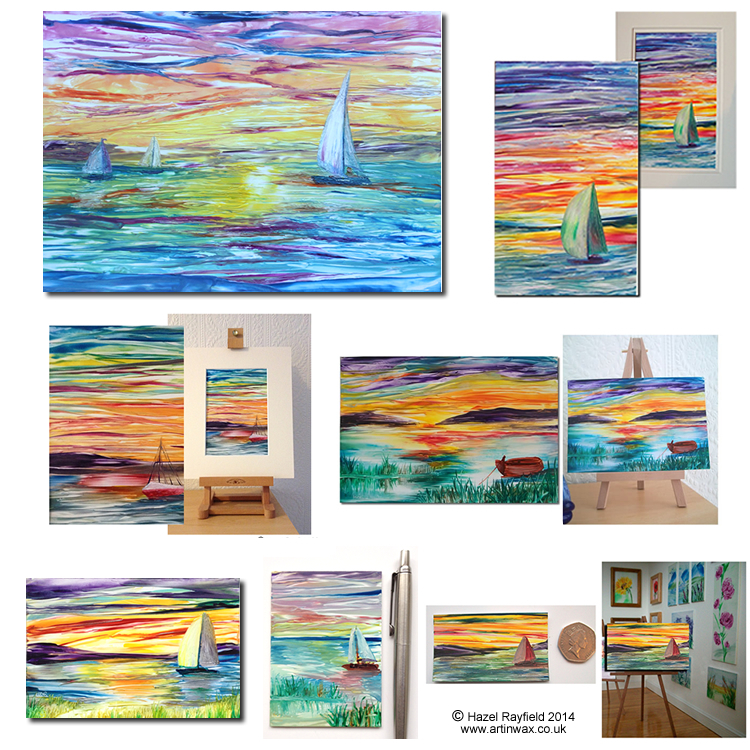 Following on from the amazing response the new Art In Wax online Exhibition : “Sunsets” received I have now sold several sunset paintings, two from the exhibition were sold the first day of the launch and since then I have painted more and even had requests. The online exhibit featured paintings in three sizes but this has now expanded and I have painted some smaller pieces in this series including some postcard size pieces which are about 6 x 4 inches, some ACEO (Art Card size at 3.5 x 2.5 inches) together with a couple of miniatures, which are displayed in “The Gallery” our dollhouse style 1:12 scale Art Gallery. There are a selection of sunsets available to purchase online direct from me the artist in the Art In Wax shop and you can also view a selection the sold pieces online via the website, and I am open to painting commissions in this style if you would like one painted especially for you. I love Colour – Can you tell ? Painting these sunsets has been great fun and I will be painting more, the style is more impressionistic in places as the colours stand side by side and not as blended as in some of my artwork. This together with how vibrant the wax colours are brings this series a new dimension and energy which gives me the freedom to paint with the brightness and contrast of colour that I love so much. The images below are a selection of this series paintings which can be found on Art In Wax. All are painted in hot wax and on Encaustic gloss card.